William McBEAN, b. 1808, Renfrew, Scotland, son of Daniel McBEAN & Isabella CAMPBELL was married in Perthshire in 1833 to Ann ROBERTSON, b. 1814 Perthshire, Scotland, daughter of Alexander ROBERTSON & Margaret CADDELL. William & Ann McBEAN along with five children arrived at Portland, S-W Victoria in 1857 on the "Mary Ann". It appears from the records that another two children (Margaret & Isabella) either died young or remained behind in Scotland. It is possible they married in Scotland and emigrated under their married names. William McBEAN (1808-1891), and family appear to have been living in the Carapook area in the 1860s. William had a signature on an 1865 letter from the Bruk Bruk School Committee. His son William was a teacher at Carapook Common School. The family moved north to the Minimay & Goroke area. Margaret McBEAN b. 1834, Perthshire, Scotland. Isablella McBEAN b. 1836, Lanarkshire, Scotland. Ann McBEAN b. 1838, Renfrew, Scotland, d. 1895, Goroke, Victoria m. James REECE 1828-1907 and had children at Muntham, Casterton & Goroke, Victoria. William McBEAN b. 1840, Renfrew, Scotland. m. 1876, Mary Ann SMITH (dau. of John SMITH and Elizabth GRANT) and they had a large family. William was a teacher at Carapook Common School and they had a large family. The family moved north to the Minimay & Goroke area. Obituary : William McBEAN, "West Wimmera Mail," 9th July 1915. One of the oldest residents of the Goroke district in the person of Mr William McBEAN, passed away on Monday in the Horsham hospital, of which institution he had been an inmate for three weeks. The cause of death was general breakup. Mr McBEAN was in the early days a school teacher under the common school system. He taught at Carapook, Winiam, and other places. He came to Victoria with his parents when a boy, and settled in the Goroke district over 30 years ago. He had occupied various positions, including those of secretary to the Goroke Agricultural Society, inspector for North Riding of the Kowree Shire, and registrar of births and deaths. He was of a very kindly disposition. He leaves a widow and grown up family. Mrs Mat MOLLOY, Misses May, Georgina, and Annie are daughters, and Messers William, John, James, and Charles, are sons. Alexander Hugh McBEAN, b. 1880, d. 1898, Goroke, Vic. Isabella Ann McBEAN, b. 1882, Edenhope, Vic, d. 1889. Georgina Margaret McBEAN, b. 1889, Minimay, Vic. Alexander "Sandy" McBEAN b. 1842, Renfrewshire, Scotland, d. 1917, Casterton, Victoria m. Emma SMITH 1846-1925, b. Norfolkshire, England to Henry SMITH and Mary Ann LIVOCK. 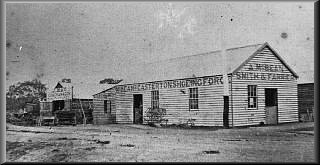 Alexander became a blacksmith of Sandford, Carapook, Edenhope & Casterton, S-W Victoria. William Robertson McBEAN, b. 1871, d. 1876, Casterton, S-W Vic. Henry Smith "Harry" McBEAN, b. 1872, Edenhope, S-W Vic, d. 1937, Casterton, S-W Vic., m. in 1903 to Elizabeth Ann STORIE 1876-1959, b. Sandford, S-W Vic., d. Casterton, S-W Vic. Alexander "Alex" McBEAN, b. 1873, Edenhope, S-W Vic., d. 1940, Melbourne, Vic., m. in 1904 to Margaret FLACK 1875-1934, b. Casterton, S-W Vic., to John FLACK & Ellen PRIEST, d. Melbourne, Vic. Mary Ann "Minnie" McBEAN, b. 1875, Casterton, Vic., d. 1955, Melbourne, Vic., m. Donald McLean CAMERON 1876-1941, b. Harrow, S-W Vic., d. Melbourne, Vic. Annie Robertson McBEAN, b. 1877, Casterton, S-W Vic, d. 1928, Albury, NSW, m. John William SMITH, b. 1877, Melbourne, Vic., to David SMITH & Jane Bain REID, d. 1952 Violet Town, Vic. 2 sons. Eliza Smith "Lily" McBEAN, b. 1879, Casterton, Vic, resided Casterton, d. 1947, Casterton, S-W Vic., m. James HAMMERTON 1886-1949, b. Allendale, Vic., WW1 service with 59th Battalion & AFC, d. 1949, Melbourne, Vic. George Smith McBEAN, b. 1881, Casterton, S-W Vic, d. 1948, Casterton, S-W Vic., m. Gladys Mary Muriel LYNDON 1889-1957, b. Bealiba, Vic., d. Melbourne, Vic. William Robertson "Willie" McBEAN, b. 1881, Casterton, S-W Vic., d. 1935, Casterton, S-W Vic., m. Mary Robertson HAIG 1889-1988, b. Yackandanah, N-E Vic., d. Hamilton, S-W Vic. 2 children. Robert Livock "Bob" McBEAN, b. 1883, Casterton, Vic, d. 1938, Casterton, S-W Vic. Charles Robertson McBEAN, b. 1885, d. 1886, Casterton, S-W Vic. Isabella Smith McBEAN, b. 1887, d. 1887, Casterton, S-W Vic. Eliza McBEAN b. 1858, Casterton, Vic. d. 1944, Kaniva, Victoria.